Lounge Sessions: get regular mixed media videos of my creative life! 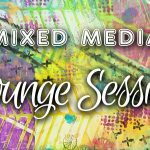 LOUNGE SESSIONS = regular mixed media videos! Want to see the ‘behind the scenes’ of my creative life? Making art for the simple joy of making art! Get regular videos of my creative life in your inbox! Not the best quality but… better than nothing, right?! I’m only able to share these moments with you because I will save time NOT editing, NOT listing supplies used (most can be found in my store mixedmediastore.com.au) & NOT responding to questions… Nobody really knows how time consuming it is to creating full video tutorials with a list of supplies, instructions, photos etc until they try it out themselves haha If I’m sharing less than perfect videos with you then it leaves me more time create more videos so it’s a win-win right? Not so nice videos are better than no videos in my opinion! That means a bit of camera wobble, not the best lighting, you may see the tripod feet sometimes, the angle may not be the best to see what everything I’m doing, and what I’m filming may not always be super exciting but… That’s just reality! I’ll do my best to show you what I’m doing as I go along and what I use but it will be minimal. If you prefer more polished videos, do check out my ‘Studio Time’ videos instead… Showing you less than polished videos goes against my slightly OCD nature but in the end, sharing is caring, right?! I have always had my own little studio (it hasn’t always as glamourous as it may sound!) where I paint and play and film but lately, caring for my fur baby has forced me to do almost all my work next to him. His health issues and dementia means he cannot/will not stay at my feet in my studio downstairs unfortunately so… I created a smaller, secondary studio next to him upstairs 😉 Oh, and that’s in my lounge as I’m sure you have figured out by now! Playing and experimenting with supplies, creating journal pages, art tags and so on can get pretty messy and take space, right??? Yeah…… We all have that problem 🙂 So I had to create a mini version of my larger studio (I’ll do a video with more details soon) so everything fits one one desk, in one corner of the lounge – which is why the camera is placed as it is in the videos. Get notified every time a new video is posted! Don’t forget to watch the intro video at the top of this page to understand what Lounge Sessions are (and are not) about!